This coming week we will begin our publication of the 1st Quarter 2018 Wrap Up. The Wrap Up audios will be published on Thursday by 6pm ET. For the first two weeks of April, Dr. Joseph P. Farrell will join me to discuss News Trends & Stories. In Part I, we look at the 10 top stories of 1st Quarter 2018 in Economy & Financial Markets. Please make sure you listen to Story #1. It describes recent developments that pose significant risks to us all and underscore the importance of enforcing the Constitution and the federal financial laws. As you listen, check out our web presentation for News Trends & Stories including our complete trends list, our choices for top news videos of the year, our updated report card for the Trump administration, and our description of each of the 10 top stories. The link will be posted in subscriber links this coming Thursday when we post the Wrap Up audios. In the week following we will cover the 10 top stories in Culture, Science & Technology and Space as well as discuss Go Local, UnAnswered Questions and Inspiration. As our discussion is lengthy, we will publish both full-length and chapter-length versions so you can listen selectively if you prefer. These discussions explore recent events to find the most important developments that will inform the months ahead. In our third week I will cover equity markets and publish the Blockbuster Chartology from Rambus for the first quarter, 2018. 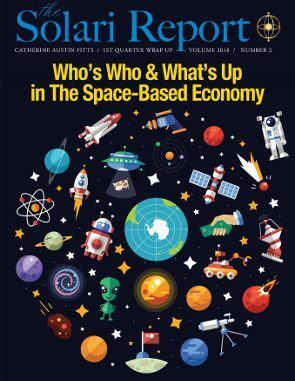 In the final week we will address our 1st Quarter Wrap Up theme: Who’s Who & What’s Up in The Space Based Economy. Investment in space is clearly a long lived trend with many aspects. We will look at the different activities, industry sectors and provide updates on our lists of public and private enterprises. In Money & Markets this week I will discuss the latest in financial and geopolitical news.Please post or e-mail your questions for Ask Catherine. In Let’s Go to the Movies, I will review World Order 2018 – a new documentary by Vladimir Soloviev in which he interviews President Putin on recent events, including the war in Syria and the Middle East, the expansion of NATO, the immigration crisis in Europe, and the arms race. This video continues to be taken down or blocked so if it is down at the current link, you should be able to find it on a search.